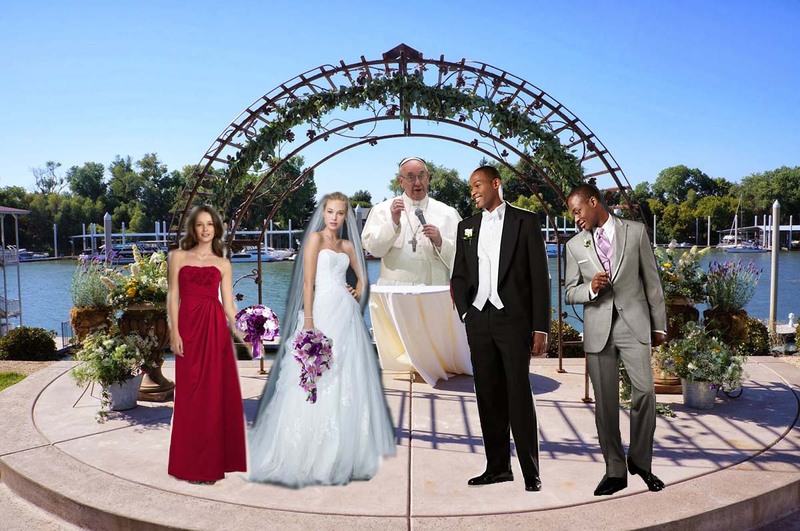 This is what the altar would look like for a wedding made up of models and officiated by the Pope. If you are getting married at a religious site, check how much personalization you will be allowed to use. Many religious weddings don’t allow deviation from the ceremony or secular music, for example. Traditionally in Christian ceremonies the bride’s parents and guests sit on the left of the “altar” and the groom’s family and guests are on the right. For Jewish ceremonies, it is the exact opposite, bride right, groom left. You can rope off the first couple of rows for specific VIPs. If you use your groomsmen as ushers, they can make sure that the right people get these seats. Back in the olden days, you might receive a pew card with your invitation which would tell the usher which pew you were in. Or at the least, the usher would ask you “bride or groom?” and seat you on the correct side. It was expected that ushers would be able to recognize VIPs and seat them correctly. In a traditional Christian ceremony, the groom, best man, and officiant would walk in first, from the side of the church and stand at the altar. Then all the ushers/groomsmen would walk down the aisle in pairs and join them. They would be followed by the bridesmaids, also in pairs. The Maid of Honor would follow them alone. She would be followed by the flower girl and/or ring bearer. Then finally the bride and her father would walk down. In Christian ceremonies, both sets of parents are seated in the first row on their respective sides. Sometimes the Mother of the Bride and the parents of the groom or other important VIPs are escorted to their seats by an usher after all the other guests are there but before the “real” processional starts. In a traditional Jewish ceremony, the Rabbi would be at the front. The best man would walk down followed by the groom and both his parents. Then the maid of honor followed by the flower girl. Finally, the bride and both her parents. In traditional Jewish ceremonies, both sets of parents stand under the Chuppah with the bride, groom, and rabbi. For both Christian and Jewish ceremonies, in the recessional, the bride and groom would go first, followed by the bridesmaids/groomsmen who are now paired off. I am including the traditional formats for processionals and recessionals for informational purposes, but to be honest, I’ve never seen any wedding follow those traditions exactly and you can do whatever works for you. And apologies for the Judeo-Christian norms, but that’s all old etiquette books include! It is ideal to have seats for all of your guests unless the ceremony is VERY short. Typically, everyone will stand when the bride appears at the top of the aisle. It is a good idea to have your officiant to invite people to sit once everyone is at the “altar” otherwise, everyone might end up standing the whole time, which is no fun for anyone. The whole standing for the bride thing makes some couples uncomfortable, and you can certainly put notices in your programs, or make announcements or whatever you choose, but it’s so engrained that people might do it anyway. It’s a new thing, but requests that guests don’t take pictures during the ceremony are perfectly fine. Everyone gets hung up on the idea of the bride’s father walking her down the aisle. Even Miss Manners has always said that the bride should choose whoever she wishes to walk her down the aisle, whether it be a father or stepfather or whoever. If she doesn’t have a father, her mother is the ideal option, no need to find a male relative to walk her. Of course, you also can walk down by yourself or with your partner if you wish. Ultimately, as long as your guests are reasonably comfortable, the ceremony is the one part of your wedding day that is literally all about you and you can do pretty much whatever you want. So use traditional vows or write your own, do some kind of unity ceremony if that floats your boat (sorry, but blech), anything goes! Just try to avoid cultural appropriation!